How much do I have to pay when ordering my class ring? A $60.00 deposit is required when ordering your class ring. You can pay in full or take advantage of one of our payment plans listed below. If the $60.00 deposit is an issue for you, please contact our office to set up an individual payment plan. Do you have any payment plans for purchasing class rings? 1. Make a minimum $60.00 down payment and pay the remaining balance at the time of delivery. 2. J-PAY Plan: This plan divides the total cost of the ring into three equal monthly payments charged to your existing credit or debit card. No deposit is required when using this plan. 3. Personal Payment Plan – Make a minimum $60.00 down payment and create your own personal payment plan. When can I order a ring? To ensure you receive an in-school discount on your class ring, order on your school order week. How long will it take before I receive my class ring? 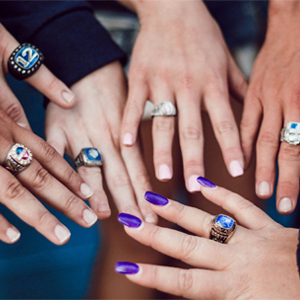 Most class rings are delivered to you at your school during the school’s Official Ring Ceremony. If you are not able to pick up your class ring when it’s being delivered, for an additional charge, the ring can be mailed to your house after the delivery event. Is there a warranty on a Jostens class ring? ***These services are provided for the lifetime of the ring, free of charge.